ST AUGUSTINE, Trinidad -- The first Diplomatic Academy of the Caribbean has already graduated its first cohort of 23 students in an inaugural module on contemporary diplomacy. The Academy, a joint project between the government of Trinidad and Tobago and its ministry of foreign affairs, and the University of the West Indies (UWI) through its Institute of International Relations was successfully launched at the St Augustine campus of the UWI on May 6. It was immediately followed by an intense five-day module on contemporary diplomacy: issues and processes, facilitated by Professors Jorge Heine and Andrew Cooper from the Balsillie School of International Affairs, co-editors of the Oxford Handbook on Modern Diplomacy. Anthony Carmona, president of Trinidad and Tobago, attended a brief ceremony to witness the closing of the inaugural module on May 13. United Nations Secretary General Ban Ki-Moon delivered greetings via video message at the launch which was attended by government ministers and government officials, several members of the diplomatic corps in this region, secretary general of the Caribbean Community (CARICOM), the dean of the Korea National Diplomatic Academy and other dignitaries from across the Caribbean. Ban Ki-Moon praised Trinidad and Tobago’s commitment to advancing 21st-century diplomacy as it would “enhance the understanding and practice of contemporary diplomacy with a distinctive Caribbean perspective”. Participants at the inaugural module were guided through the fundamentals of public diplomacy and the balancing of national, regional and global interests as well as contemporary challenges diplomats face. There was also a session on digital diplomacy and ‘Twiplomacy’ (Twitter diplomacy) along with practical training including a simulated United Nations meeting. 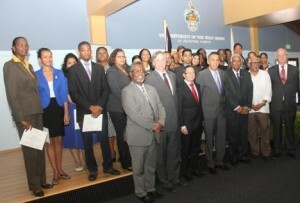 According to Professor Andy Knight, director of the UWI’s Institute of International Relations, “Unlike other diplomatic academies, the Diplomatic Academy of the Caribbean was envisioned as a training facility that would give prospective and current Caribbean diplomats the competence to practice a new form of diplomacy that would be relevant to the changed condition of the 21st century”. The Academy is being established initially for a two-year project basis, with an objective to meet a clearly felt need, in the absence of any proper training and learning facility of its kind regionally. The next module -- protocol and diplomatic law – is a two part cycle. The first is scheduled for June 23 – June 27, 2014, and the second from June 30 – July 4.